We were approached by Simon Oliver from OCPSS, who had been appointed to project manage the design and fit out of two financial companies merging together in the heart of London’s financial district. 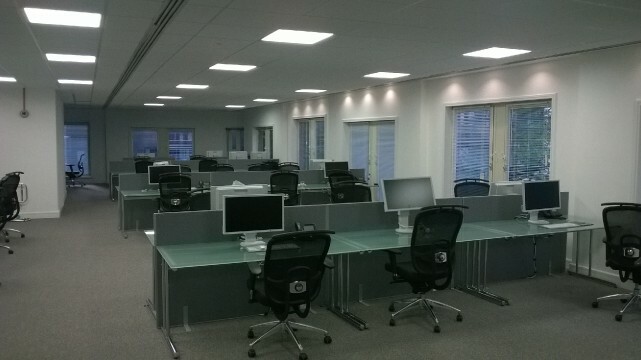 116 - Artoline glass desks 1600mm x 800mm - Manufactured in Germany. Glass enhances the dynamics of the company by portraying a clean aesthetic throughout. 116 - ECT Mesh backed chairs with integral coat hanger on the back - useful to hang your jacket on after a hard morning trading. 54 - Freestanding screens with tackable membrane. 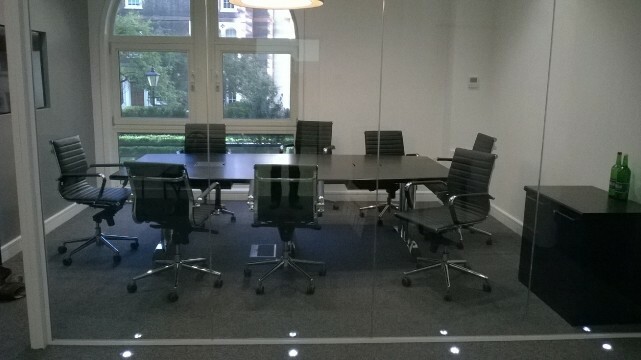 7 - Cirrus boardroom tables (not on website) but from the same family as Nimbus. These boardroom tables are hand made from 40mm veneer, stained by hand to Wenge (dark wood) with lift out flaps on the top of the tables, leading to a wooden box which holds all the power modules and cables. The table tops are supported by a chrome leg double upright leg which is extremely sturdy and runs centrally. The legs are supplied by a high quality manufacturer who manufactures for Hands Wycombe, another highly reputable office furniture supplier. 3mm Harwood edged lipping. We also supplied matching credenza in the same Wenge finish. We supplied CAD drawings detailing every aspect of the table and showing exactly where the lift up flaps and legs would be situated. The boardroom tables have been very well received by the client and on the opening night, the largest table at 6 meters long hosted a meeting with London’s Mayor Boris Johnson and guests. 64 - Aria Medium backed Eames style chairs (for all boardroom tables) which have a ribbed real leather effect - available in black or white. These are based on a design classic by Charles and Ray Eames which has stood the test of time. 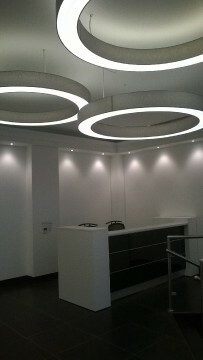 1 - Valde reception desk black gloss front with LED lighting and white storage ends. After weeks of hard work for all parties involved, the new furniture was a big success for both Simon and his client. THINKING ABOUT MAKING CHANGES YOURSELF? NEED A HELPING HAND? LET US BE THAT HELPING HAND!